The other day I decided to explore SQL Server AlwaysOn feature and committed myself to write an article or two about this technology. Extra incentive there for me was also the fact than more and more K2 customers using AlwaysOn to protect their K2 database and I am getting more and more exposure to this feature in my day to day work. It turned out to be surprisingly difficult to have a grasp of what is AlwaysOn conceptually, just because as soon as you start reading up or configuring it you will see that it is rather amalgamation of different technologies which you’ve probably seen before separately, which were improved and joined together under new marketing term/name to provide you with comprehensive disaster recovery (DR) and high availability (HA) solution which gives you more than SQL Server Failover Clustering (FC) combined with deprecated SQL mirroring feature. Though in case you have tons of experience with these two you probably don’t need any introduction to AlwaysOn either. I guess once you will read through this article you will also notice how this technology is shaped out of familiar building blocks, but what I also hope for is that you will get a grasp of what is AlwaysOn, and get a basic understanding of how it works. I will fully cover installation and configuration of SQL Server AlwaysOn environment (using new and shiny SQL Server 2017) in my next article while focusing on technology overview here. Normally I put a short conclusion/recap at the end of my articles, but to cater for the needs of modern reading audience with short attention span and purpose of this article I will give short and basic definitions in the very beginning so that you can get them first and if you want to go into more details you can just read on and learn more details. First two terms to clarify here is HA and DR – two things SQL AlwaysOn is all about. HA is ability of an application or service to run without downtime for prolonged periods of time. This time is normally expressed in nines which translate into amount of acceptable downtime.  Beyond of available downtime windows HA uses different technologies to ensure that service interruption not happens, and our application runs without downtime. Essentially it is all about providing maximum uptime. In a layman terms you can say that HA is an ability to hide outages from end users. DR, in turn, intended to address major disasters/problems which make it impossible to run our application without interruption (e.g. loss of an entire server or datacenter). It is more about recovery time (i.e. how quickly our application is up and running on another server or in another datacenter). In a layman terms it is an ability to recover from outages quickly. HA and DR almost always go together and there is even a unified acronym “HADR” which refers to all HA and DR technologies and approaches, sometimes people even using and pronouncing it as word “hadr”. HA ensures that users see no outages, and DR ensures that if there is an outage, we can recover from it quickly (there is some downtime, but we are trying to minimize it). From these definitions you can see that HA and DR have different yet closely related goals. When it comes to SQL Server there is two most prominent HADR technologies we used to have before Always On release – SQL Server FC instances and database mirroring. Though extended list of SQL server technologies which can be used in for HADR in one way or another may look as follows: log shipping, replication, mirroring, AlwaysOn AG, clustering. We have had SQL Server FC as an HA solution for along time. FC itself is a Windows Server technology which predates SQL Server (available since Windows NT 4.0) and it is supported in SQL Server since version 6.5, though in reality SQL Server FC instances or FCIs become widely used at around the time of SQL Server 2000. With SQL Server FCI we have a SQL Server instance level protection / operating system level protection with shared identity and ability to move our SQL instance to another node in case of primary node failure. With FCI we not protecting databases, we protect the server and safeguarding our SQL Server instance against server failure. If server A fails shared resources (disk, SQL instance with databases) move over to instance B. FCI is not a load balancing (LB) solution for SQL as Active/Active mode for the same instance is not supported. Important point about SQL FCI is need for shared storage which adds extra layer of complexity and potential single point of failure. In SQL Server 2005, Microsoft introduced SQL Server database mirroring to offer database level protection which can offer both HA and DR (depending on synchronization mode you configure). Cool thing about it is that we can have zero latency and zero data loss (databases are completely in sync). 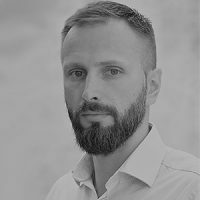 Conceptually you may think about mirroring as a continuous log shipping, as is continuously takes changes from your database log and ships them to a partner server continuously whereas log shipping doing this on schedule (underlying mechanisms for these two technologies are different though). Mirroring also has automatic failover to the partner. Yet there are major downsides/limitations: your failover target is unusable (meaning you cannot use it for let’s say reporting or other read-only operations) and you can only have one failover partner, it also works only on one database level (mirroring for each database must be configured separately). AlwaysOn offers both HA and DR options for SQL server and it is an umbrella term of SQL FCI HA and improved mirroring feature set in the form of SQL Server AlwaysOn Availability Groups (AG). You can also consider it as a replacement for database mirroring. Always On uses Windows Server FC as a foundation for enabling Availability Group for database (or databases) level availability and for creating a failover cluster instance for instance level availability. Another notable distinction is ability to use direct attached storage (DAS) instead of shared storage (SAN/SMB). Bottom line here is that unless you inherited legacy SQL server mirrors in your environment(s) to take care of you should always plan your SQL HADR design with AlwaysOn feature set in mind. You can have set of databases managed as a single AlwaysOn AG with single listener and fully automated failover. This AG is in turn can be synced across four AlwaysOn nodes: two nodes in the same data center configured as failover partners for HA, third one as a read only node for analytics/reporting and fourth node hosted in separate data center for DR.
You can see how this layout covers HADR requirements with an added benefit of performing your backups from secondary node so that our backups do not have impact on performance in production. I hope that after we went through terms and features you have an idea of what is SQL Server AlwaysOn and how you can use it. I now want to give a little bit more extra details about SQL Server AlwaysOn and finish off this introductory article with brief overview how its feature set evolved from SQL Server 2012 to SQL Server 2017. As you can see already SQL Server AlwaysOn is HADR solution for SQL Server which simplifies management and utilization of hardware resources involved into SQL Server HADR. With Always On you can configure HADR for application database(s) and/or entire instance. From the technology standpoint AlwaysOn leverages things we saw before both in SQL FCI and database mirroring. SQL FCI is only HA solution which supports automatic failover and guarantees instance/OS level redundancy. It is not truly loaded balancing solution for SQL as SQL FC does not support Active/Active mode for one and the same SQL Server instance. Though with SQL FC you can do something close to Active/Active mode with two SQL Server instances within one cluster when Node A has Active instance A and Node B has active instance B, but it is not true LB for a single SQL Server instance (which at any given moment runs on only one active instance), it is Active/Active only in a sense that two nodes of SQL FC run two different active SQL Server instances and act as a failover partners for each other. 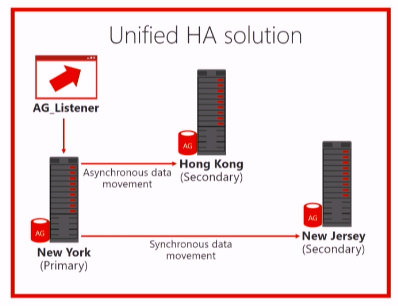 SQL Server database mirroring is something that gives you DR and HA/LB depending on the way you configure it. Roughly speaking AlwaysOn mixes these two familiar technologies adding database availability groups so that final mix allows you to meet both HA and DR goals more efficiently. To provide availability for entire instance we have AlwaysOn Failover Cluster Instances. Here is where it all gets a little bit confusing. To make it straight we have Windows Server Cluster which may refer both to NLB and FC, so more precise term is FC, next we can have SQL Server Cluster which is SQL Server installed on top of Windows FC (aka SQL FCI), and next we have AlwaysOn Failover Cluster Instance which basically refers to Windows FC used as a foundation for Always On AG functionality. Up to SQL Server 2016 Windows FC service was required for enabling AlwaysOn AG functionality and it was used mainly for health reporting and witnessing for AlwaysOn AG nodes. Sound a little bit confusing, right? But as soon as you familiarize yourself with new things and design patterns possible with AlwaysOn and go through set up of your own test lab it all should become clearer (especially with that SQL FCI versus AlwaysOn FCI thing, which in practice just looks as a slight difference in set up process). It is almost the case when not knowing technologies we had before almost helps  Another problem here is that a lot of documentation still intertwined and uses both old (pre-Always On) and new terms. As I already mentioned, database mirroring is a “deprecated” technology which is being replaced by AlwaysOn AG. If you worked with database mirroring you will find familiar concepts in AlwaysOn AG if didn’t work with mirroring that’s not a big problem as with Always On you can do more of the same and it is easier to do it . While FC is protecting SQL instance with use of shared storage, database mirroring offers database level protection by means of syncing (mirroring) them to other instances (mirrors) and it works a bit better for geo-stretched designs when moving shared storage during failover is not always a viable approach while continuous synching works. In a way it is similar to logs shipping. There are two modes of mirroring – high-performance with risk of possibility to have lost transactions (asynchronous) or safe mode with higher latency (synchronous). Synchronous mirroring can be DR solution while asynchronous one can be HA solution (when used with witness). As I mentioned above database mirroring had certain limitations most critical of them being that it does not have shared identity similar to cluster name in FC and inability to have more than one secondary. All these limitations have been addressed in AlwaysOn. Secondary Replica – secondary DBs which can run synchronously, asynchronously, RO and/or as a failover partner. Always On AG includes everything listed above to provide complete SQL HADR solution. To finalize my Always On overview below you can see brief overview of how its feature set evolved from its initial release in SQL Server 2012 up to now. Support for Distributed Transactions (DTC) which applies to distributed transactions between databases hosted by two different SQL Server instances or between SQL Server and another DTC-compliant server. One of the most anticipated feature from this list was support for HA in Standard edition, though what we get in Standard Edition of SQL Server 2016 is “Basic Availability Groups”, which a limited so that they give you the same capabilities as you had with database mirroring. Basic availability groups provide failover support for single database and allow you to have single replica for primary database using either synchronous or asynchronous commit mode. It was done just because without this a lot of people weren’t able to accept SQL AlwaysOn as a full replacement for database mirroring which was available both in Standard and Enterprise editions. Installation without domain was made possible with release of Windows Server 2016 where Windows Server Failover Clusters are no longer require that all nodes in a cluster reside in the same domain. You can read up about features added in SQL Server 2016 AlwaysOn in this MSFT SQL Server blog post. Clusterless support (i.e. you can now enable AlwaysOn Availability Groups without having FC installed on Windows Server or without Pacemaker on Linux). I think it is worth clarifying as to what exactly is possible without installation of Windows FC (note here we speak about installing WFC components and not about configuring SQL FCI). Without FC you can only have read-scale availability group. I guess I will quote official Microsoft documentation here: SQL Server 2017 introduces two different architectures for availability groups. 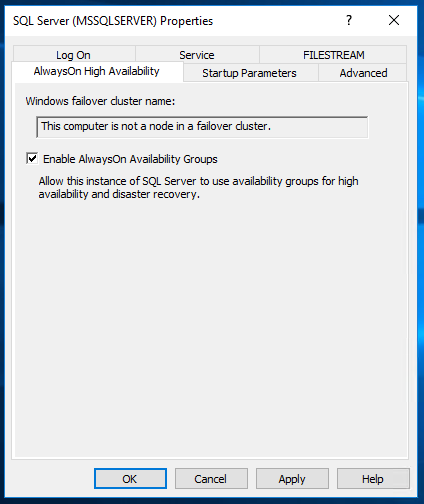 AlwaysOn availability groups provide high availability, disaster recovery, and read-scale balancing. These availability groups require a cluster manager. In Windows, failover clustering provides the cluster manager. In Linux, you can use Pacemaker. The other architecture is a read-scale availability group. A read scale availability group provides replicas for read-only workloads but not high availability. In a read-scale availability group there is no cluster manager. It means despite you can now enable that crucial checkbox depicted below on a server without WFC components installed it does not mean that WFC dependency is fully removed and you no longer need that foundational building block for complete AlwaysOn functionality. Picture 2. AlwaysOn can now be enabled without WFC, yet it will only work for read-scale availability group. Windows-Linux cross-OS migrations and testing (i.e. you can now have primary replica on Windows Server and secondary on Linux). Cross-database transactions are now supported among all databases that are part of an AlwaysOn Availability Group, including databases that are part of same instance. This concludes overview of AlwaysOn feature set evolution. We can clearly see that by now SQLAlways On is a mature feature which positioned by Microsoft as technology of choice for mission-critical HADR for SQL data platform and meets the requirements of being reliable, integrated, flexible and efficient. Indeed, after looking at feature possibilities we discussed SQL AlwaysOn really offers unified approach to SQL HADR which covers different areas, and it saves you from the need of stitching HADR solution from different technologies acquired from different vendors – removing complexity in support and management. I hope this article was sufficient for initial technology overview and in the next one I will be covering installation and configuration of SQL Server AlwaysOn AG step by step using SQL Server 2017. In case you want to read up more on the specifics of this technology you may refer to the official Microsoft documentation for Availability Groups, and I should say that Microsoft documentation really becomes better and better nowadays. In case you have any questions or feedback about this article just let me know in the comments below.